When we go back to school on Monday , we will need to begin steadily raising the humidity, because everything I have read says it needs to be high for them to hatch. On Monday or Tuesday we will need to take out the egg turning mechanism and replace it with lots of wet paper towels in case they hatch during the night. Once they begin hatching, we have to leave them alone until they all hatch. We can’t help them, because it is part of their developmental process to get out of that egg. They can stay in the incubator after hatching for up to 48 hours with no introduction of food or water, but they won’t need to stay that long. I will be taking pictures, so that is something else I need to do this weekend: charge my camera battery. I am clearly more excited than most of my students, but that is okay… this is more than a lesson, it is one of those things I have always wanted to do :). We candled the eggs with a flashlight and a cone of cardboard in the supply closet about a week ago, but it is an inexact science at best. We could see a big blob in about 50-60% of them, and some we weren’t so sure what we were seeing, but in one we actually could see a heartbeat and the outline of the chick [which is actually scary to me since maybe we should have been seeing that in all of them and maybe only a handful or, God forbid, one is developing]. Since we are dealing with four different kinds of chicken eggs with differing shell opacity, weight, and color, it definitely affects how much you can see. Our flashlight also left a lot to be desired in brightness and focus, so it was not as definitive an exercise as I had anticipated. This photo is lifted from the Internet as we did not take pictures of our candling. 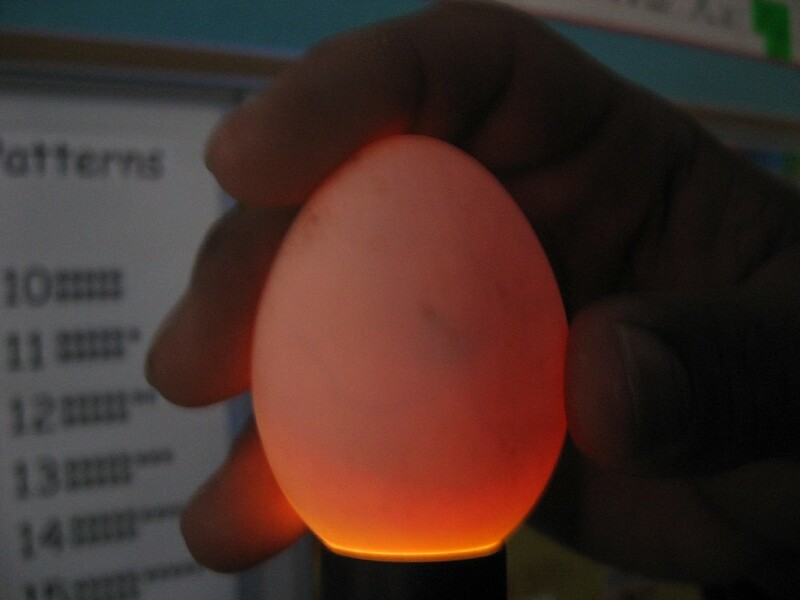 I am not sure what kind of light this is, but if we had put our eggs onto the flashlight we had, we would not have seen this. We had to go into a completely dark supply closet one or two students at a time and check one or two eggs at a time until we did all 23. I am hoping we get at least 12 chicks out of this, that is my goal, but I would be happy to witness just one hatching. It is all a learning experience, and anticipation, like always, is half the fun.